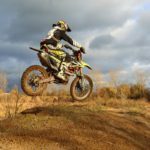 Best Knee Braces and Knee Guards For Dirt Bikes 2019 – Which To Choose? 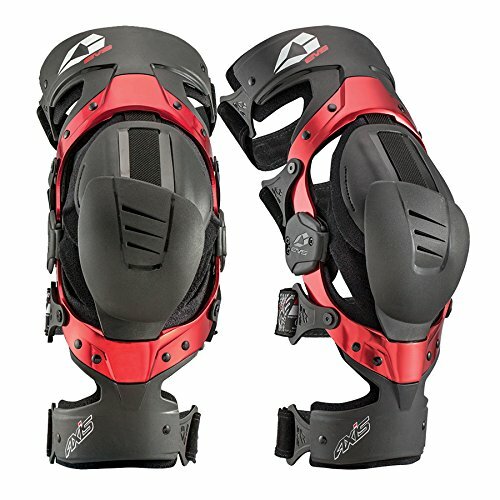 If you’re considering whether to buy dirt bike knee braces or just knee guards, keep in mind the extra cost of good knee braces is money well spent. When you consider the cost of surgery, time off work, loss of riding time, or living with a long term knee injury, the cost of a brace is a small price to pay. Knee injuries can happen so easily. You don’t even have to be going fast or come off the bike. Simply dabbing your foot on the ground at the wrong angle can do enough damage to give you years of pain. A lot of riders wait until they have had a knee injury and then go out and buy a knee brace to protect the damaged knee. Remember knee braces are designed to prevent knee injuries from happening in the first place. Statistically, they have been shown to at least half the risk of injuring your knee. If you’re serious about racing, then a motocross knee brace is a must, but even the weekend warrior needs good protection. Remember “Dress for the crash, not the ride”. Knee guards should be the absolute minimum protection for any dirt bike rider or adventure rider. Research has shown that knee braces at least half the risk of knee injuries and they provide way more protection than just a knee guard. 1. The most common injury at 43% is to the ACL (Anterior Cruciate Ligament) which joins the Tibia and Femur. It is usually injured through twisting and/or hyperextension during cornering, putting a foot down, jumping or slipping off the peg. 2. The second most common injury at 20% is the Meniscus, the cartilage that absorbs shock in the joint, It can be injured when dabbing the foot on the ground with force. 3. The third most common injury at 15% is the MCL (Medial Cruciate Ligament). The MCL limits sideways movement in the knee. Source: Knee injuries and the use of prophylactic knee bracing in off-road motorcycling: results of a large-scale epidemiological study. This video has excellent information to help you decide between knee guards or knee braces. 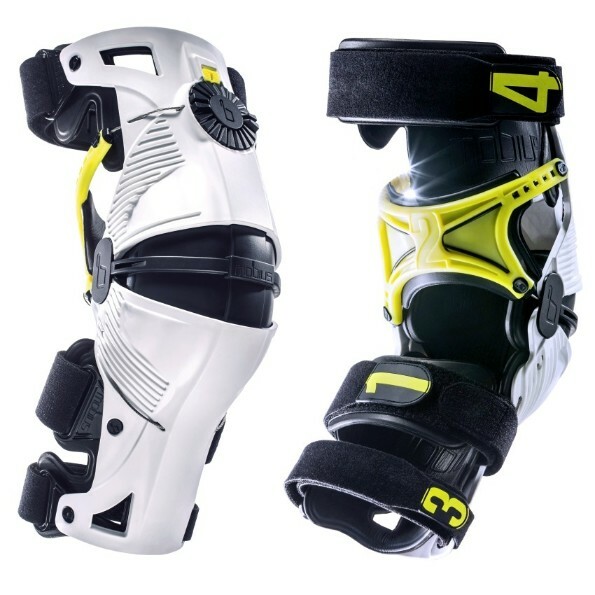 Knee Guards Or Knee Braces – Which To Choose? A lot of riders are confused about the difference between a knee guard and a knee brace. Some think it is only people who have already suffered a knee dislocation that need to wear a knee brace. To complicate things further, there are also manufacturers selling knee guards and calling them knee braces. Knee guards: are designed to reduce the severity of an impact or abrasion to the riders’ knee and shin during a crash. Knee guards won’t protect you from hyperextension, twisting or jolting of the knee. They’re generally made of a hard plastic shell and foam padding. They slip inside your boots and are designed to be worn under your riding pants. The price starts around $30 for a cheap set. Knee Braces: are designed to protect the rider from lateral trauma and hyperextension type injuries. They also have knee and shin padding, but their main objective is to protect the riders’ knee joint from dislocation. They are made from a range of materials depending on the brand and commonly have a solid external frame with a hinge at the knee joint level. There are some knee guards on the market which claim to be knee braces. They are basically beefed-up knee guards with hinges on them. While these may be fine as knee guards, they do not have the features required as below to qualify as a knee brace. Hinge and Arms: A strong hinge with two pivot points that follow the knee’s natural range of movement and long sturdy arms for strength. Good braces have padding on the inside of the hinge also. Overall length: It should be long enough to provide grip adequate grip to the leg to minimize twisting and hyperextension. It should fit into your boot to protect your lower leg. Good strapping: A good brace always has two straps above and two straps below the knee that don’t stretch. Some even have a pad on the lower calf strap for comfort and silicone to prevent movement. Adjustable extension stops: Strong stops that can be adjusted to suit the hyperextension of the leg. Knee Cap Protection: A strong patella cap for impact protection. It should be well padded and extend above and below the patella. Some of the most popular brands of knee brace are the POD, Leatt, Mobius and Alpinestars. Others from Asterisk, EVS, Troy Lee Designs, and Matrix are producing great braces offering varying levels of protection and safety depending on what they are designed to do. As with most products, you’re going to get what you pay for, so the top of the line knee braces will come at a higher price. When you consider a joint as fragile and important as the knee, the cost of a brace is far outweighed by the cost of medical bills, time off work, and possibly living with a knee injury for the rest of your life, and not being able to ride your dirt bike! If you can afford any of the mid-level to higher end knee braces from US$600 and up, then a good fit is far more important than the brand. A poor fit will only half protect you. Each manufacturer designs their brace to fit what they think is an average leg, so the less average your leg, the worse the fit is going to be. If you have thin, fat or very muscular legs, you may find that none of the off-the-shelf braces will fit, and you may have to look at custom braces. Should you get custom knee braces? They are expensive, but if you’ve got the money, they will give you the best possible protection. If you have an existing knee injury then it makes sense to get the best brace you can. Similarly, if you have unusual shape legs that don’t work with off-the-shelf braces, or if you’re over 40 and your knees are just not what they used to be. One of the best custom knee braces available today is the CTi knee brace. It is distributed by Gall Bros. Medical founded by Australian motocross legend Stephen Gall. CTi knee braces are used by top MX riders like James Stewart (USA), Kirk Gibbs (Australian MX champion) and Toby Price, desert racer and two-time Dakar champion. Note: If you have an existing injury, sometimes you can claim an orthopedic brace like the CTi custom against your medical insurance. You may also be able to claim some tax benefits depending on your job, you will need to talk to your accountant on that. Don’t wear two layers under your brace, they will move against each other and allow the brace to move. Make sure the velcro straps don’t catch on your pants when taking them on or off. Take your boots along when trying knee braces for fit. Let’s look at 5 of the Best Knee Guards available today, then 5 of the Best Knee Braces. The Fox Racing Titan Pro is one of the most popular under $100 guards on the motocross knee guard market. It is designed to give you good shin, knee, and lower thigh coverage. While it’s not technically a knee brace, it has a 3-piece hinged and floating knee cup that is seamlessly joined by a dual pivoting bio-mechanical hinge. It is secured by a Pos-Lock buckle system which features a one-time strap adjustment which is designed to keep it in place throughout the whole range of leg motion while riding. 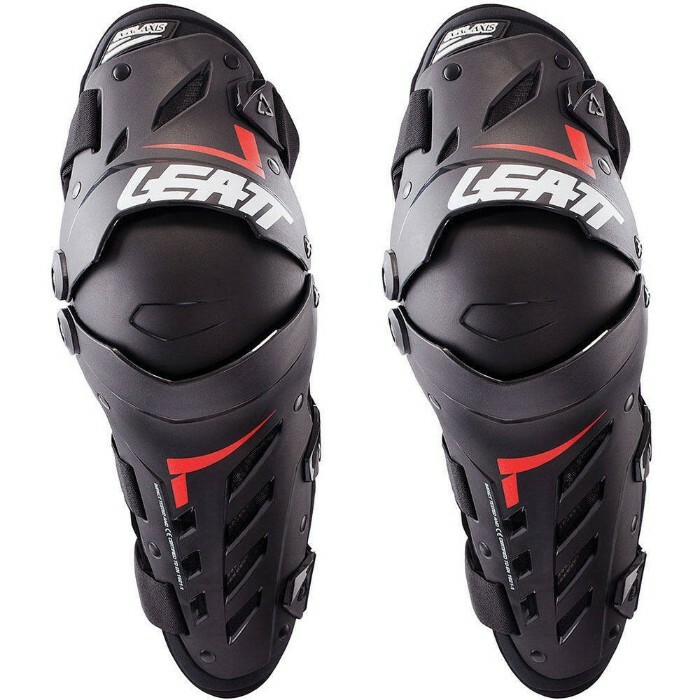 The Leatt Dual Axis Knee and shin guards are a comfortable and well-ventilated knee protector with two pivot points that allow them to bend with the knee’s natural movement in a similar way to knee braces. They are designed to cover the knee, even when fully bent, as well as the lower thigh and most of your shins. Like most of the Leatt products they are CE certified for impact protection and score a total of 25 points on Leatt’s Total Protection rating system. They are also CE certified for abrasion resistance. The strap buckles won’t catch on your riding pants due to their low profile design, a common complaint with knee guards. The straps themselves have a soft vented ‘airprene’ backing material that makes them more comfortable and resistant to slipping, an important factor as they can’t work as designed if they slip out of place. Since Shift stormed onto the motorcycle scene it has become an international brand known for producing innovative riding apparel using progressive designs, premium materials, and advanced construction methods. 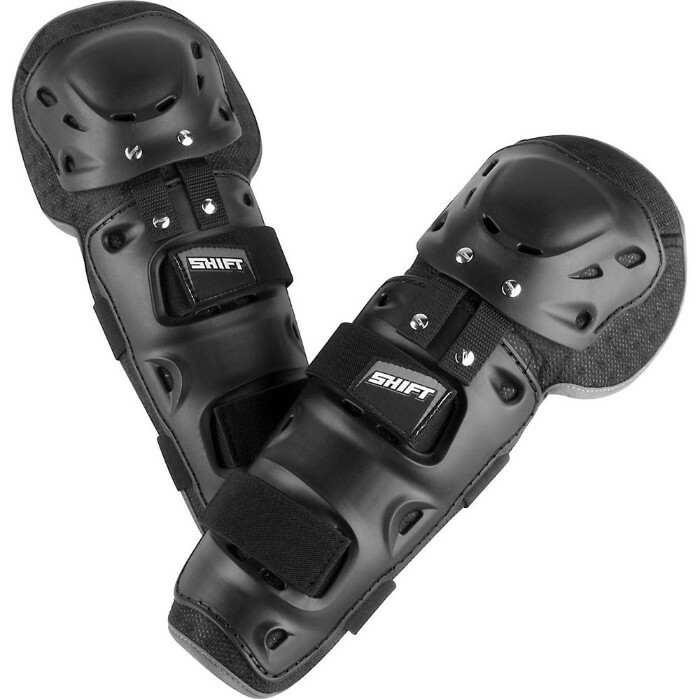 The Shift Racing Enforcer Knee/Shin Guard is at the budget end of the knee/shin guard scale, but they provide excellent knee and shin protection. They are used not just for dirt bikes, but most forms of motorcycling, ATV, as well as ice hockey, baseball and any other outdoor activity requiring knee impact protection. They are suitable to be worn under or over pants and are marked left/right, although it’s hard to distinguish a difference. 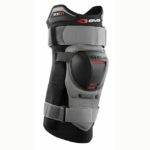 They are a well-constructed multi-purpose knee/shin guard at a fraction of the price of other guards that offer no more protection. The Fox Racing Titan Race Knee/Shin Guard is another popular product from Fox Racing. It now incorporates a Posi-Lock buckle system which features a one-time strap adjustment which is designed to keep it in place throughout the whole range of leg motion while riding. I have used an older version of these guards for about a decade, and I have had many stacks and landed heavily on my knees. They have worked every single time and still show no signs of falling apart. 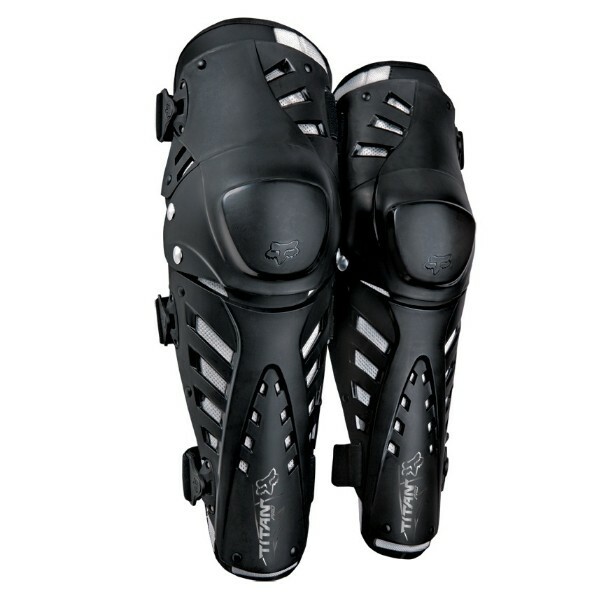 They are well vented and give you a full knee and shin coverage. The Alpinestars SX-1 Knee Guard is CE certified knee protector. 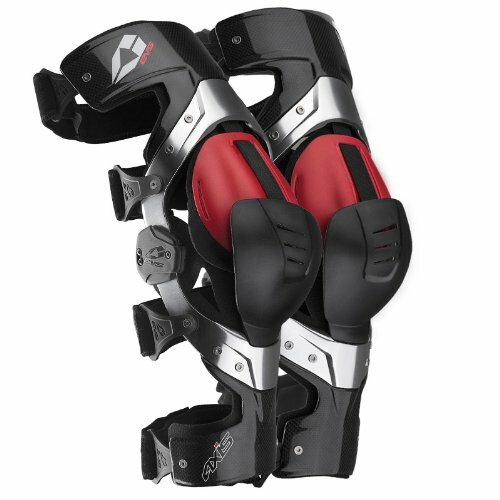 While it has the Alpinestars Dual Gear System (DGS) dual pivot design, it is not a brace. The upper and lower frames are constructed from a high-performance polymer blend which gives a high level of flexibility and strength and is extremely light. The polymer plates are well perforated for maximum breathability and air ventilation. The SX-1 features an asymmetrical and slim profile design which gives you a personalized and tight fit while still allowing you plenty of movement. The Leatt C-Frame Pro Carbon Knee Brace is a mono-hinge knee brace, there is no hinge on the inside. This is to give you a good feel of your motorcycle. It is a medically certified knee brace and CE certified for impact protection. The hinge on the outside is a very robust metal gear hinge which is designed with two pivot points that allow the brace to replicate the knee’s natural motion. 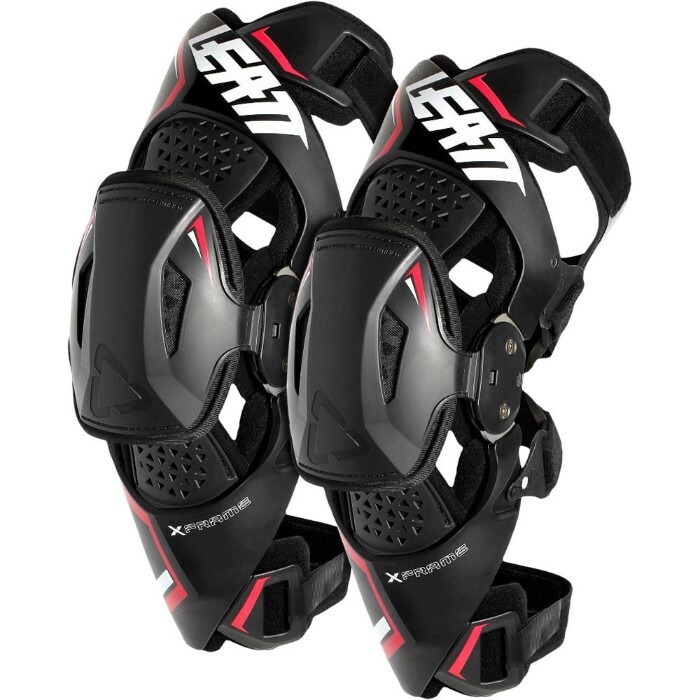 Leatt uses what they call the ‘3 Point Force control’ which means the brace uses 3 contact points on your leg, the upper outer thigh, inner knee, and outer calf to control the knee. It is designed with lab-tested engineered breakaway points to prevent possible fractures to the Tibia and Femur. The C-Frame is a medically certified knee brace. The Patella cup is CE certified for impact and there is a handlebar protection plate just above the Patella cup. The shin plate is very low profile so that it can easily fit inside your boots. A nice bonus is that Leatt also provides knee brace sleeves to wear under the braces, so that saves you a bit of money not having to buy them separately. The Mobius X8 Knee Brace is unique in that it uses the CCRS (Continuous Cable Routing System) to externally reinforce all of the cruciate ligaments. The closure system securely and comfortably holds the brace in place and provides reliable tension and a repeatable amount of pressure on the front and rear of the knee, whether your knee is bent or extended. 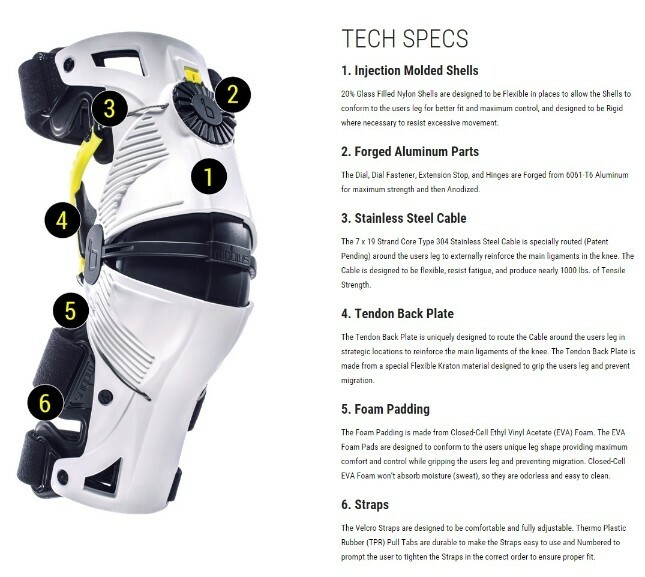 It was developed by Engineer Darren Fleming, who had suffered a repetitive knee injury, and sought to find a knee brace solution that was unlike anything on the market. He sought the help of nine-time AMA MX/SX champ Ryan Villopoto, who had suffered from multiple knee injuries himself. Ryan was an instant believer in the design and joined the development team to turn Fleming’s vision into a reality. Another MX/SX champion Ryan Dungey is also backing the product. 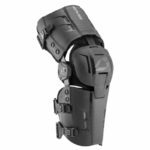 After seven years of research, development, and prototyping they created the X8, one of the most advanced knee braces available today. The X8 is designed to give you full overlapping coverage from the bottom of your shin to the middle of your thigh. It also gives you protection from rotation, hyperextension, and bending that can cause severe knee injuries. A great feature is the numbered velcro straps to help you tighten the straps in the correct order to ensure you get proper fitment, an important factor in the brace working as designed. Measure 6″ (15cm) up the thigh from the center point of the knee cap, then measure the circumference of the thigh. 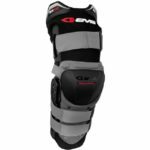 The EVS AxisSport Knee Brace uses hybrid technology which combines an aluminum chassis and a reinforced nylon chassis. 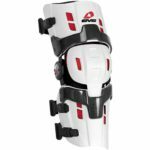 The Axis Sport Knee Brace is modeled after the higher end EVS Axis Pro (At No. 4 below) for lightweight comfort and flexibility. It utilizes reinforced nylon injected upper and lower cuffs, and the monocoque hinge allows for a low profile structure. The result is a lightweight, comfortable and rigid brace. The Tru-Motion 2.0 hinge is designed to mimic the knee’s natural range of motion so that the brace works with you when riding, and it is aluminum construction so it’s very lightweight and durable. The hyperextension can be adjusted from 0 to 30 degrees with the six replaceable stops that are provided with the brace, so you have a lot of adjustability there. Great if you have a previous knee injury and need it to lock out earlier. 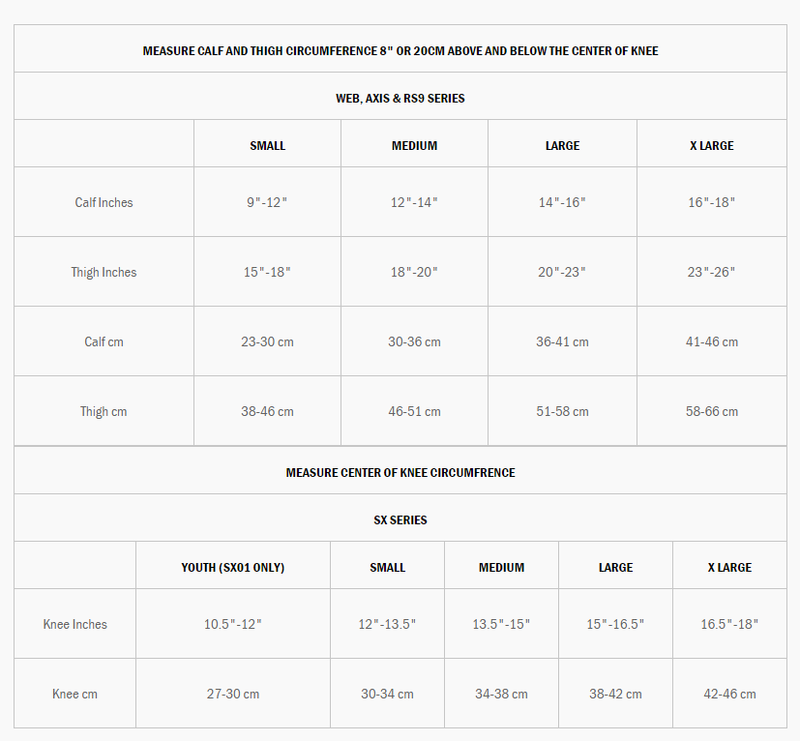 It also comes with extra hinge pads of different thickness so that you can adjust the fit to the width of your knee. The EVS Axis Pro Knee Brace uses hybrid technology which combines an aluminum chassis and a carbon fiber chassis. The main difference between the Axis Sport and the Axis Pro is in the construction materials. The Axis Pro uses carbon fiber upper and lower cuffs, where the Axis Sport uses reinforced nylon, which flexes more than the carbon fiber. 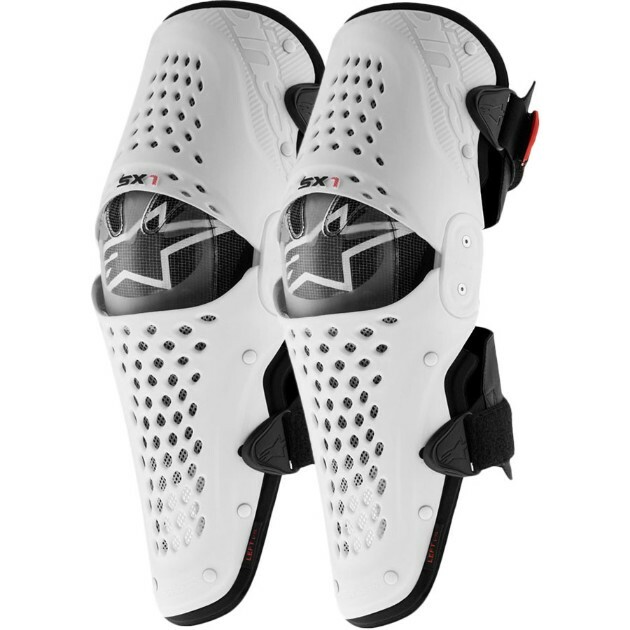 Like the Axis Sport, it uses the Tru-Motion 2.0 hinge which is designed to mimic the knee’s natural range of motion so that the brace works with you when riding, and it is aluminum construction so it’s very lightweight and durable. It also features the Dual Defense total tracking knee cup which gives the knee full coverage full time through the total knee motion, so in the event of an accident, if your knee is bent, the knee is still protected above the knee cap from handlebars or levers that may cause injuries. The brace is also designed with crumple zones so that it will absorb the impact and prevent a possible fracture to your Femur (Thigh) or Tibia (Shin). The hyperextension can be adjusted from 0 to 30 degrees with the six replaceable stops that are provided with the brace, so you have a lot of adjustability there. The neoprene liner is removable so that you can easily wash it to keep it fresh. Fitting is easy with two velcro straps above and two below the knee. The Leatt X-Frame Knee Brace is one of the more affordable knee braces from Leatt, well known for their quality protection from neck braces to knee braces. The X-Frame is not their high-end knee brace, but it still features a carbon composite frame for lightness, metal geared hinges, and a lot of components from the high-end brace. Like most Leatt products, it is medically certified and CE certified for impact protection. Where the Leatt C-Frame has only one hinge on the outside of the knee, the X-Frame is a more traditional brace with asymmetrical hinges on the inside and outside of the knee. The hinges are a very robust metal gear hinge which have two pivot points that allow the brace to replicate the knee’s natural motion. The medial hinge (inner) is 40% thinner to give you that good control and feel of your bike. The Patella cup is CE certified for impact and there is a handlebar protection plate just above the Patella cup. Hyperextension can be adjusted between 5 and 20 degrees with the interchangeable extension stops provided. There are also interchangeable hinge pads so that you can get the perfect fit to your knee. The strapping is numbered 1 – 4 in the order that you tighten them to ensure you get a proper fitment. 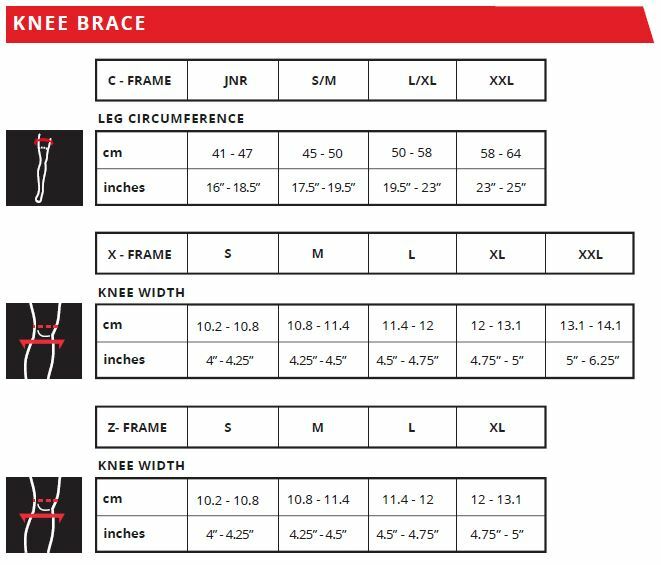 Like the C-Frame, Leatt also provides knee brace sleeves to wear under the braces, so that saves you a bit of money not having to buy them separately. Sizing: They come in four sizes: Small, Medium, Large and X-Large. 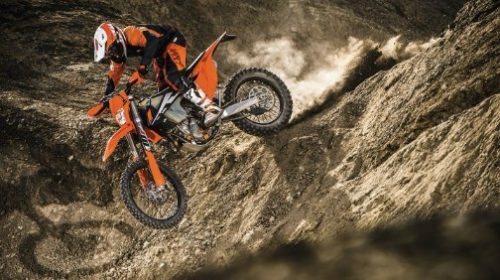 As dirt bike protective gear is getting lighter and better designed, we are seeing more and more gear that was once considered just for motocross racers being used by enduro, trail and adventure riders. Right after a good helmet and boots, knee braces, neck braces, and body armor are becoming the norm for all dirt bike riders. 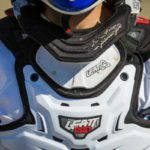 This post has looked at the 5 of the best dirt bike knee guards, and 5 of the best dirt bike knee braces. At a minimum, knee guards are a must for any off-road rider. All of the guards in this review are excellent at what they are designed to do. 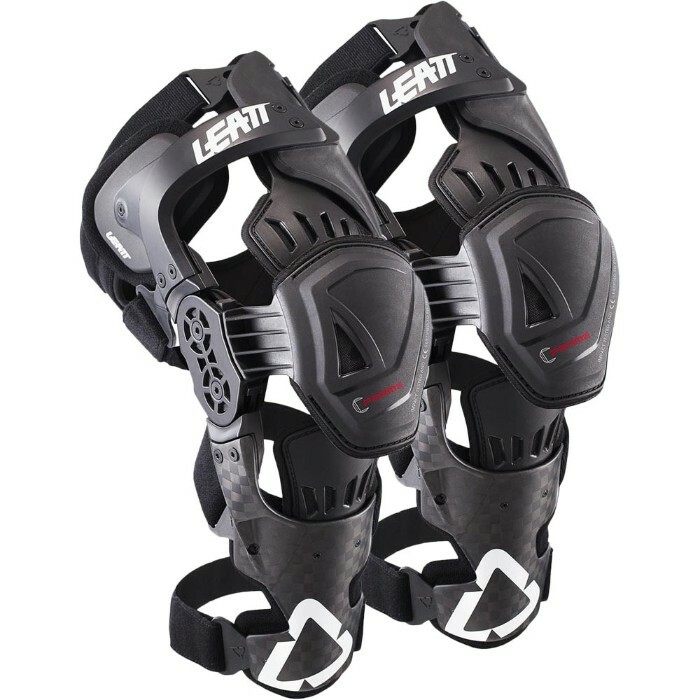 My Knee Guard Top Pick would be the Leatt Dual Axis Knee and shin guards, due to the CE impact certification, and the full coverage they provide for the lower shin, knee and lower thigh. The Knee Braces looked at here are all at the more affordable end of the pricing scale, but they are all excellent knee braces. Any one of them would be a good choice. Getting a good fit is vital to the brace working as it’s designed and all of these braces give detailed sizing requirements so that you can pick the right size for you. A Custom Knee Brace is the ultimate in protection. If you have a previous knee injury, you can’t find an off-the-shelf brace to fit correctly, or you simply want the best possible protection and the price isn’t an issue, the CTi custom knee brace by Gall Bros. Medical is the best of the best, used by top racers worldwide. 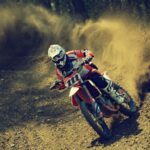 This post is provided as a way of raising awareness of the use of dirt bike knee braces and guards. It is recommended that if you are considering purchasing any safety equipment, you carry out your own research and consider all data available to allow you to make an informed decision. The incidence of motocross injuries: a 12-year investigation. Do you use a knee guard or a knee brace? Please feel free to share your thoughts on what is working for you. Thank you for this wonderful post, you must have put a lot if energy into this, I think knee braces and guards help lessen the effect of serious injuries. It gives protection to the biker and also making bike less risky. 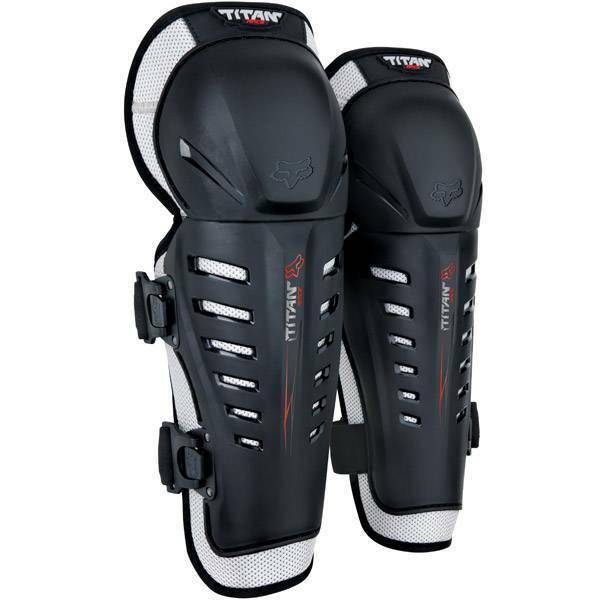 From your review I think I will go for the Fox Racing Titan Pro Knee/Shin Guard because tt is less expensive and fit well for all. Hi, Clement. Fox Racing are well known for good quality gear. It is the sort of knee guard I use, and while it isn’t a knee brace, still offers good protection from impacts.